Hello Friday! This monthly musing is with Cara from the fabulously named Patternbooth. 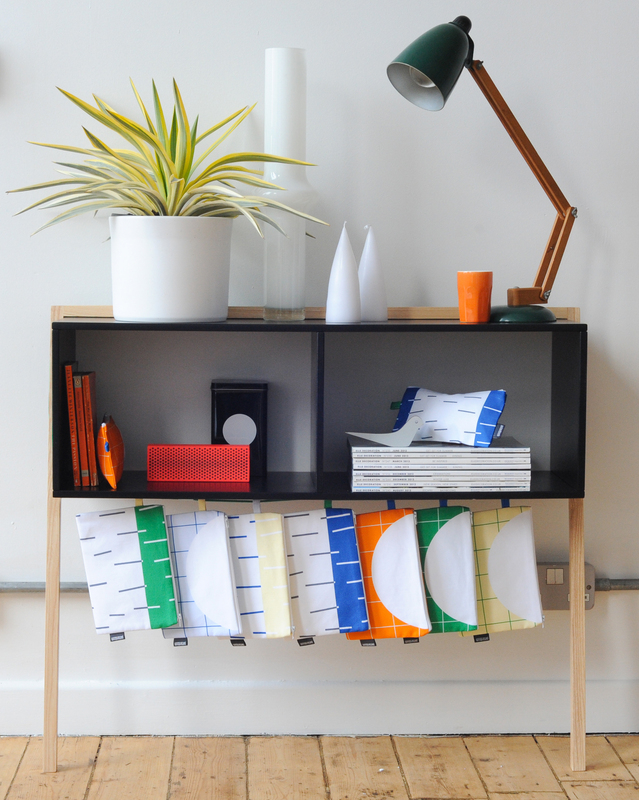 A quirky British homeware brand based in Nottingham and as Trend Bible aptly put it; with a sharp, clean, graphic look. Patternbooth is for lovers of bold design and colour and as the sixties look continues to grow in popularity in 2015… that means a lot of us! Cara’s products have already featured in Elle decoration, Grand Designs and a whole host of magazines that you’ve probably read. All her products are made in England within 70 miles of her home from high-quality cottons and papers. What is so nice to see is the story behind Cara’s designs which appear in her final products in some way – there’s an openness and honesty to her designing process which is stimulating and refreshing. 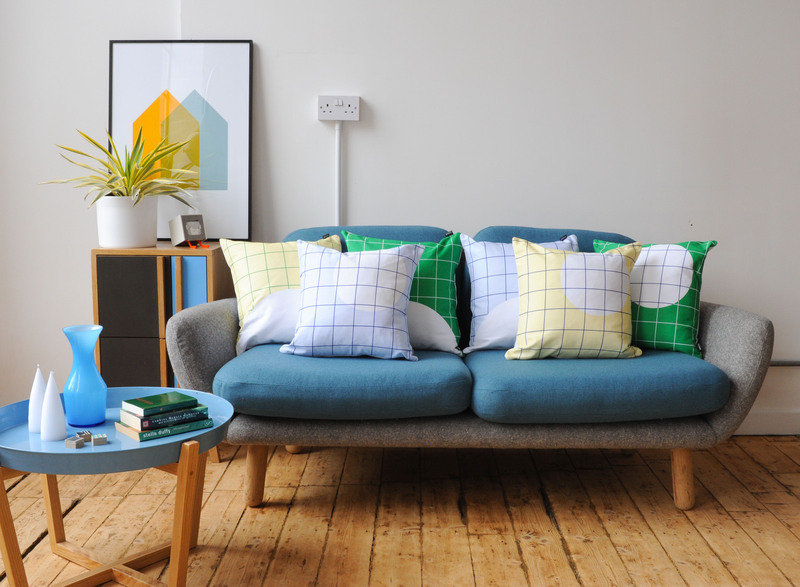 We bought the ‘Stitch’ cushion in Dresden blue (now sold out) from the ICONS collection which was created in Autumn 2013. The strong graphic lines of the collection were drawn from Cara’s inspiration from David Hockney’s 1967 ‘A lawn being sprinked’ and a book on stitch work from the Bauhaus period. The colour range was influenced by the bold colours of California that were favoured by Hockney along with a dark grey which gives a nod to some of Hepworth’s Bronze outdoor sculptures. An authentic origin of loveliness then! Hello Cara! Who inspires you and why and how does this influence your design work? I fell in love with David Hockney’s work when I was 16, back in the 80’s, and I went to my first London exhibition. I think it was at the Tate. The painting ‘we two boys together clinging’ really moved me and from then on I was hooked. I was doing a BTEC in art and design at the time and his work influenced me from that point onwards. I didn’t fall for Barbara Hepworth until a few years later in my twenties, when I saw one of her sculptures in a show. I love her use of different materials and the strength of her vision. We’ve taken design city breaks ourselves to Copenhagen, Paris, Rome etc and find them hugely exciting, fresh and inspirational. We loved seeing the journey you took translating a happenstance inlaid street pattern onto your products in your ’stories’ section. What do you think it is about travelling that makes you really open your eyes? It’s true! When I’m travelling I’m alert and looking for new things, rather than thinking about day to day tasks. So not only are there new things to see, but I’m more open to seeing them. Having launched your first collection in January 2014, how has the journey been, what unexpected highs and lows have you experienced? In hindsight I would have tested the market more before committing, but I was impatient to get out there and get going! When you start out your production chain is not as efficient as it will end up being and you really don’t know what will sell. I have some lines that have sold out and some that haven’t sold. I didn’t realise how long everything takes too… you really do need to plan months and months ahead. My advice to budding designers is to spend as little as humanly possible, and find imaginative ways to promote yourself that doesn’t cost money! Do your processes and products have eco-credentials to them? If so, which elements did you choose and why? I try very hard to produce everything close to home, so from printing to production everything currently happens within 70miles of my front door, reducing road miles and supporting small and local manufacturing. My wallpaper is made from pulp from sustainable forests, and the ink is non-toxic, the fabric is 100% cotton, even the bubble wrap I use is biodegradable! That said it’s very much a work in progress, and there are still things I can improve on. Where are you headed in 2015/16? What colours, patterns, designs are you being inspired by right now? If I’m honest I’m still undecided. The collections I have out at the moment have had a lot of great press, but they are still unknown to most people, so I’m trying not to give in to the pressure to keep producing new collections, or standing more shows! I’m still refining – I’m going to edit the colourways moving forward and I’m changing the fabric choice for the cushions. My sketchbooks are more textured right now so I’m pretty sure that will show when I finally make a decision about collection 3. Watch this space! Inspired? Cara also runs Graphic Change; a professional graphic recording and graphic facilitation service to help create visually engaging meetings, presentations and to help you and your team work more visually. Most recently Cara’s founded the School for Visual Champions; an eLearning course which provides you with the skills to think more visually – the rationale is that everyone can feel the benefits of working visually whatever type of role or sector you work in… Sharpen your pencil!